The last book that I read before law school was Chasing the Flame: Sergio Vieira de Mello and the Fight to Save the World by Samantha Power. Her previous book, A Problem from Hell: America and the Age of Genocide, began as a paper for class while she was attending Harvard Law. As I look back on the last three years, I can see how motivated I have been to find that spark for myself—my own writing to seed my own career. 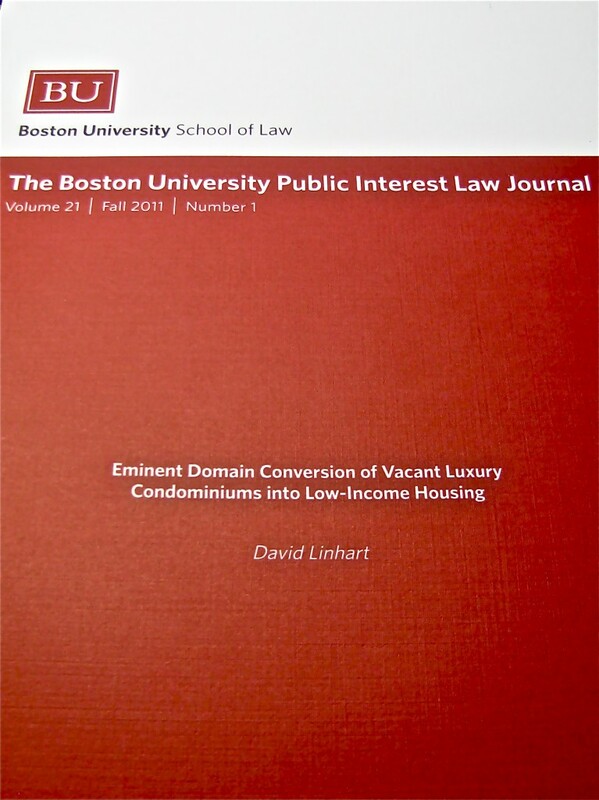 For example, my legal note for the Public Interest Law Journal started as a desktop folder for articles on eminent domain after studying Kelo, Midkiff and Berman in 1L Property Law. No one defends eminent domain these days, but it’s a robust power that isn’t going anywhere. The alternative to getting rid of it is learning how to apply it toward outcomes we can live with, and that theme runs in the background of my note—Eminent Domain Conversion of Vacant Luxury Condominiums into Low-Income Housing. At last it is published (yessss!) after several rounds of insightful editing by fellow students. Along the way, I’ve stowed away a few topics for additional research, and I’ve zeroed in on urban housing and economic development as professional interests. In the same vein as my note, every class paper I wrote was half for the class and half to analyze a chosen topic to see where I would come out on the issues—pre-workers’ compensation liability for workplace injuries; family-friendly urban housing that provides a base for economic stability; community participation in urban design for revitalization; home mortgage standardization as an exclusive economic engine after the Great Depression hit; pro bono representation as philanthropy versus affordable representation as a structured legal-social service; and brownfields redevelopment within the environmental justice movement. After the fight-or-flight response of my last exam period, the main thing that comes to mind is, “I could so easily fall asleep right now.” For three years, I’ve regularly stayed up later and got up earlier than I ever thought I could. But not moving toward the things we care about is worse than losing sleep. That’s when life really gets tiring. I’m happy to report that law school has moved me toward the things I care about, and looking back on this blog will remind me of my process of discovering applications of the law toward outcomes I can live with. I’ve thought of it as having the title Zeroing in on legal leverage for social change (with interludes about my toddler). Today, my aspirations for social impact have the small beginnings of form and substance. Also, I’ve upgraded from toddler to preschooler plus infant. Thanks for joining me on my law school adventure through this blog! Nice David! Congrats, what an amazing journey you’ve had so far. Many more wonderful discoveries to come! 🙂 I wish you all the very best! David, what a great and insightful final blog! Congrats on your publication,which I’m looking forward to read, and on having finished law school. What an amazing accomplishment! Would love to be there with you this coming weekend and help celebrate. We’ll continue the party here next month! It’s been so great reading your blogs and being with you on this journey. Thanks for inviting me for the ride. You made it! Congratulations, David. You mentioned that your piece on eminent domain was published – do you have any information on where that is available? I really enjoy reading your blog between work and school, its quite a project. In regards to Adam’s post, do you have any writings on eminent domain?